Pineapple Acai Smoothie Bowl or Boat. Lots of tropical fruit vibes and a handful of greens make this smoothie a refreshing treat! Superfoods + optional protein, vegan + gluten-free. Somehow I’ve gone over 3 years with only one smoothie recipe posted here. So here’s #2! Have you ever tried acai berries? (Pronounced “ah-sigh-EE” <-helpful when ordering in public.) Apparently acai means “fruit that cries” (your learning for the day). Whether or not you believe acai counts as a superfood, it definitely has a lot of health benefits. It’s loaded with antioxidants, phytochemicals (anti-aging properties), and may aid in weight loss. AND it’s delicious, so there. 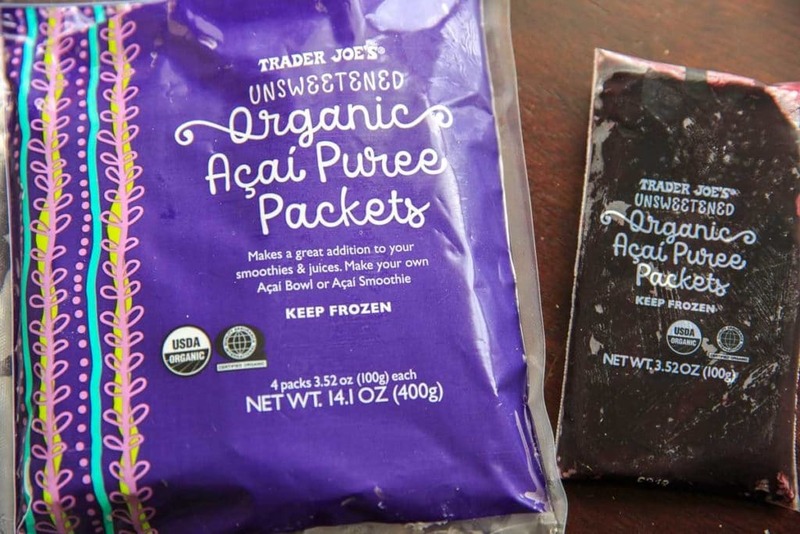 Trader Joe’s has this packet of acai berry puree that is perfect for smoothies! You can also get them online. Pineapples are in abundance around here right now, so it seemed like the perfect match to try out these acai packets. In addition to those two fruits, I added banana, a handful of spinach, a bit of juice and a few dates. If you want to turn this into a protein shake (I did!) I’ve really been loving pea protein lately. This smoothie already has natural sweetness, but I added the dates for a little extra and also for the consistency. Dates are also loaded with vitamins and goodness. I like to add a handful of spinach to my smoothies so that it’s not ALL fruit. Plus you can’t taste it, and it’s just another thing that’s good for you. See a trend here? 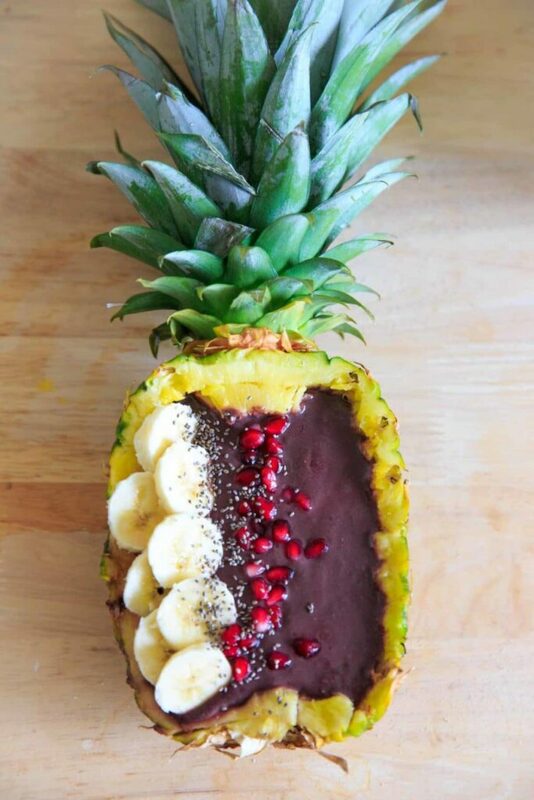 If you don’t want to buy a whole pineapple or use it for the smoothie boat, you can just eat it as a smoothie bowl! Or a regular smoothie, but then you don’t get the fun toppings. Also, if you don’t level out the bottom of your pineapple boat you may end up tipping the whole thing over while you’re trying to eat it. That may or may not have happened to me. 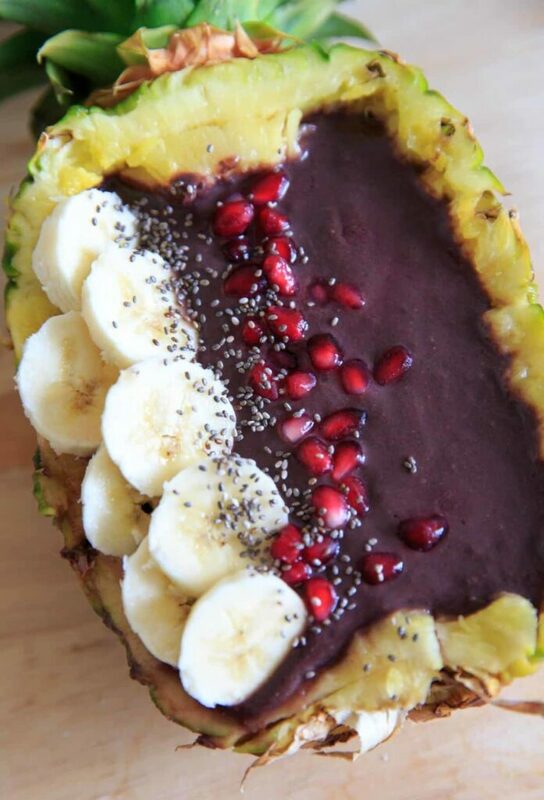 Pineapple Acai Smoothie Bowl or Boat. Lots of tropical fruit vibes and a handful of greens make this smoothie a refreshing treat! Superfoods + optional protein. Run acai packet under warm water to dethaw slightly and break into 2 or 3 chunks. Cut packet open and add to blender. Add pineapple chunks, orange juice, dates, banana, spinach leaves and protein powder (if using) to blender. Blend until combined (make sure dates are fully blended!). Pour smoothie into bowl or pineapple boat. Add toppings as desired. Enjoy! *Nutrition facts do not include optional protein powder. I have never had acai berries before but thanks to you I can now pronounce the word! Thank you for that! Beautiful photos, looks very tempting! 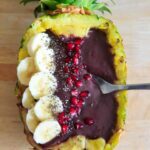 What a fun take on smoothie bowls! This looks and sounds so refreshing! This is such a beautiful smoothie bowl!! I love that you used dates to give it a little extra sweetness. That’s such a good idea–totally going to try it! 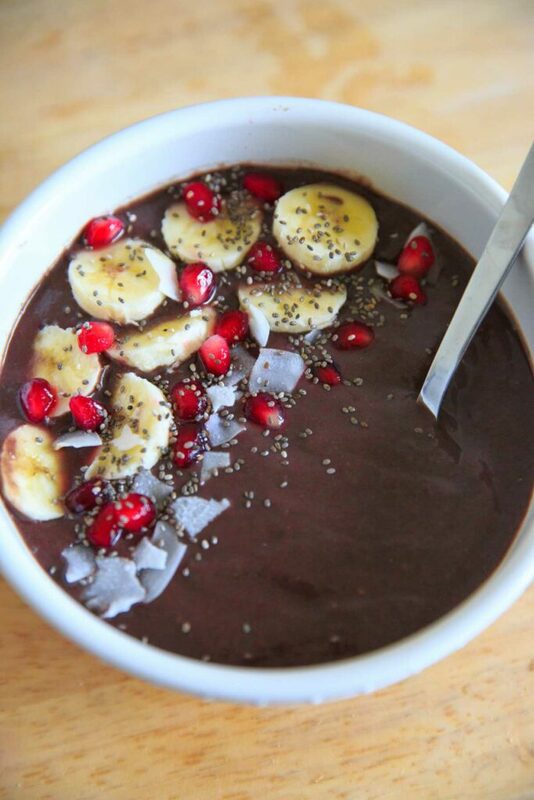 This is such a beautiful and mouthwatering smoothie bowl! And full of vitamins and superfoods too! 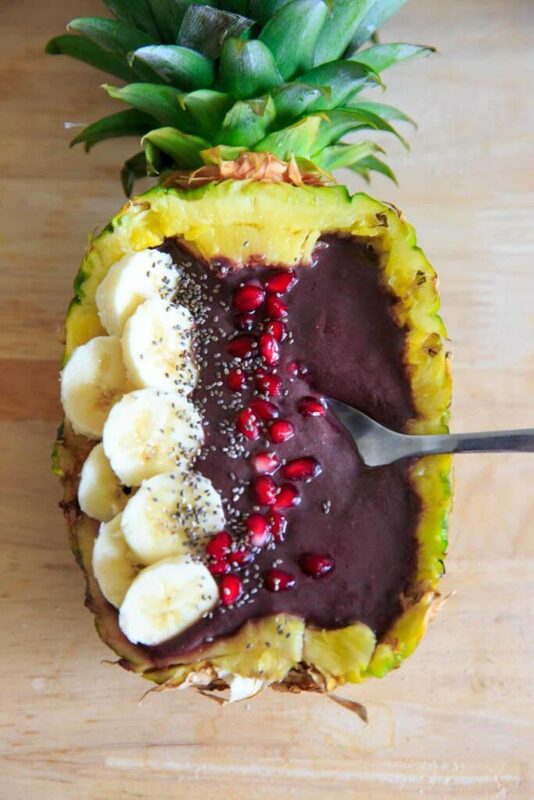 I love how you’ve used the pineapple as a bowl, this sounds like the perfect way to start the day!